Twice Round the Daffodils is a British film of 1962. Directed by Gerald Thomas, who also directed the 'Carry on' films. A comedy, it was set in a mens' Tuberculosis Sanatorium (we don't see many of these nowadays) and was somewhat darker in tone than Nurse on Wheels. Juliet played Staff Nurse Catty who stood no nonsense from her charges, but showed the compassion of the Ministering Angel when needed. 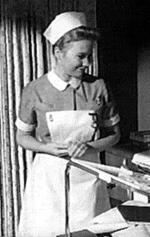 Nurse Catty played by Juliet Mills, 'Twice round the daffodils', UK 1962.